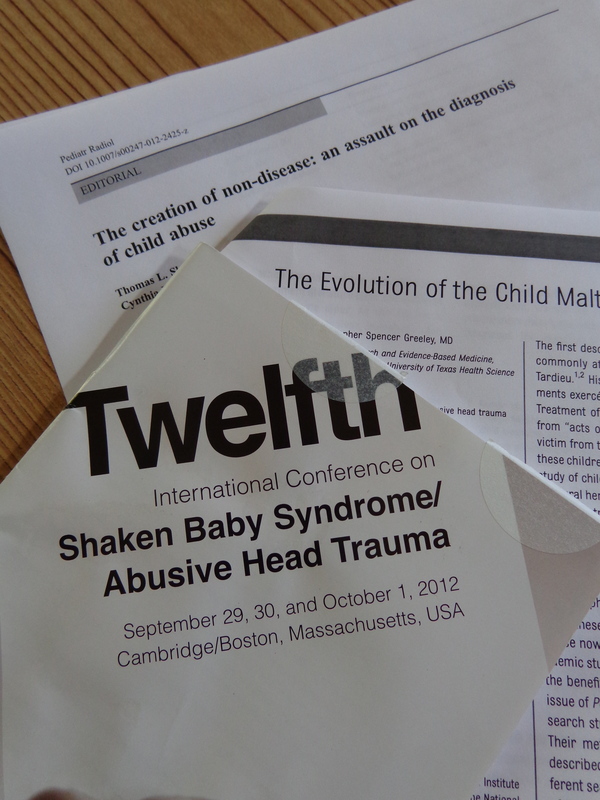 With the Twelfth International Conference on Shaken Baby Syndrome/Abusive Head Trauma coming up this weekend, I’ve been reviewing the literature and sorting my thoughts. What I see is an odd mix of new thinking and old stances. [The seminar] presented the scientifically accepted methodology for the diagnosis of nonaccidental trauma with emphasis on the pathophysiology of various injuries, and covered areas where new data have changed our understanding (e.g., subdural hematoma can occur from bleeding dural veins and not only bridging veins) [20–22]. This concept, initially proposing a non-traumatic pathogenesis of SDH in infants, namely hypoxia, advanced by Geddes et al. in a severely flawed paper with no credibility whatsoever and later repudiated by her, is not being allowed to rest in the dustbin of junk science [10-11]. The disciples of Geddes cannot allow this to happen, else they will be unable to introduce “reasonable doubt” when tetifying on behalf of perpetrators of abusive head injury to infants. Hence, they are flooding the literature with pie-in-the-sky claims that totally lack any evidence base. This transition, from “pie-in-the-sky” to “new data have changed our understanding,” strikes me as a change in the recognized model of abusive head trauma. It reminds me of comments made by a number of presenters at the 2010 NCSBS conference, when the take-home message was that the “triad” (the AHT triad, that is: subdural hematoma, retinal hemorrhages and brain swelling) was a straw man invented by defense experts to discredit shaken baby syndrome theory. The shaken baby syndrome (with or without evidence of impact) is now a well characterized clinical and pathological entity with diagnostic features in severe cases virtually unique to this type of injury – swelling of the brain (cerebral edema) secondary to severe brain injury, bleeding within the head (subdural hemorrhage), and bleeding in the interior linings of the eyes (retinal hemorrhages). Let those who would challenge the specificity of these diagnostic features first do so in the peer-reviewed literature, before speculating on other causes in court. My point is that the model is evolving in the face of new evidence. What I don’t understand is the reluctance of the child-abuse community to look back at possible mistakes in the past. I’m off to the conference now and not likely to be blogging on the road, but you never know.